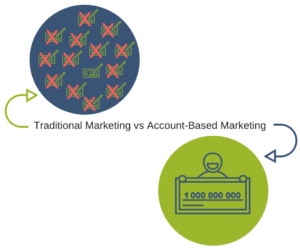 Where's My Account-Based Marketing (ABM) ROI? Where’s my Account-Based Marketing ROI? 87% of B2B marketers agree that Account-Based Marketing (ABM) delivers a higher ROI than other marketing activities (ITSMA). If you’ve never executed ABM, your patience is usually tested when starting out. We’re used to semi-quick, yet small results with traditional marketing methods. A generic email blast goes out to a purchased list, and form submissions flood in. Boom, leads. Your Sales teams then engage with these leads and become upset to learn they’re not qualified. You realize that while you have hundreds of new leads, they’re not the right leads for your business. ABM saves your company time and allows Sales to focus on extremely qualified leads. In fact, Sales will only focus on leads that are your ideal customer, based on research of your existing customers. The result? Higher ROI, customers for life, and established personal connections. 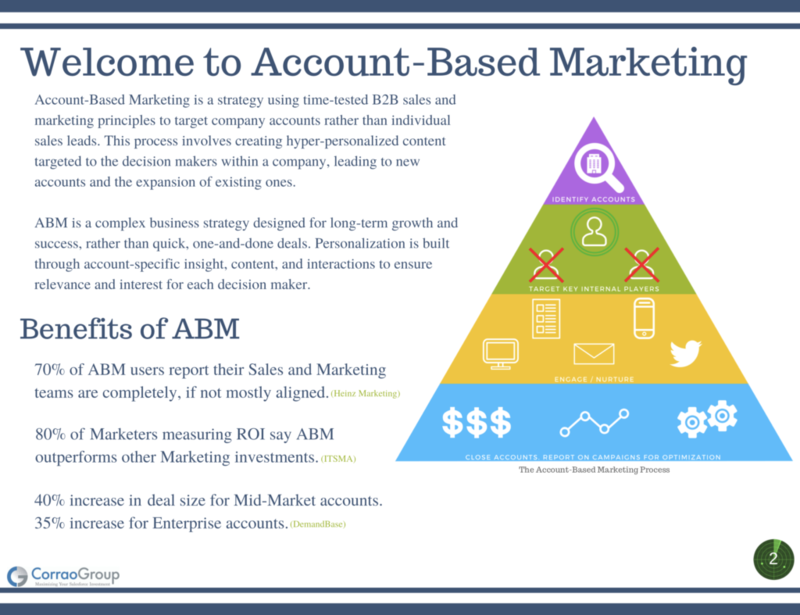 The first step in ABM is for “Smarketing”, Sales and Marketing, to come together and choose the target accounts you will go after. If you’re just starting out, we recommend selecting a few accounts, show the ROI, and expand from there. A three-tiered approach is recommended so Smarketing knows how much time to devote to an account. Tier ones are your highest valued accounts that meet your Ideal Client Profile (ICP). An ICP is a representation of your best-fit clients based on data and research. These should receive most of Smarketing’s attention, meeting face to face and establishing the greatest connection. Tier twos meeting most of your ICP, but aren’t as valuable as tier ones. Tier threes are your general leads that come in through lead magnets and your website. Adopting an ABM strategy doesn’t mean giving up on traditional marketing entirely, as that strategy will populate your tier threes. Tier threes can also move up the ranks too and become a tier one if they meet the ICP. ABM is a strategy, not a piece of technology. The ABM funnel is different than the traditional marketing funnel. ABM is a long-term, but worthwhile, investment. Now that we have those out of the way, it’s time to talk about when you can expect your ROI. In traditional marketing, a website visitor downloads a form, turning them into a lead. Marketing “qualifies” the lead, passes them to Sales and then Sales passes them back because they’re not ready to buy. This goes on for a few weeks. A month later, the lead shows they’re ready to buy and Sales closes the $1,000 deal. In ABM, Smarketing meets frequently to select valuable accounts with a great change of closing. They pinpoint the decision makers, then send them hyper-personalized content on how their tool/service will benefit them in their specific role. They send emails, white papers, physical mail, host webinars, meet face-to-face until a deal is signed for $450k. This can go on for as quick as one month, to upwards of half of a year and beyond. 91% of marketers that use ABM have indicated a larger deal size than traditional marketing. The hyper-personalized content is one reason why the ABM journey is lengthy. It takes time for Smarketing to conduct research, build the content and strategy, and make necessary adjustments along the way. The results are worthwhile, as almost everyone with an ABM strategy say the ROI outperforms other marketing efforts. Traditional marketing contains the age-old spray and pray email blast of generic content. It’s a one-size-fits-all approach in a world of personalization. Times are changing and this generic approach isn’t causing leads to pick up the phone anymore. ITSMA found that 75% of executives will read marketing materials that contain ideas relevant to their business. New ideas to advance their business. Have you ever sent custom golf balls to a stalled lead? If one of the decision makers at a tier one account is an avid golfer but they’ve gone cold, send them golf balls with a brochure on how your offering will help them in their role at the company. You’ll know they’re a golfer because you really get to know the people at these accounts. Keyword, “people”, not “lead.” This goes far above and beyond a generic email and proves you really want their business. ABM tends to have longer sales cycles but the deals are larger, the ROI is well worth the investment, and you end up with a customer for life. ABM doesn’t only bring in large deals but it also establishes personal connections with clients. It involves spending time to build a relationship with your clients rather than signing a contract and rarely speaking again. This helps recurring business, especially in B2B because of the strong relationship. It even leads to new golf or hiking partners! If you’d like to learn more Account-Based Marketing tactics, or get started, fill out our form below. Corrao Group also has a dedicated Digital Marketing Agency, including an ABM agency, to run ABM for your company.